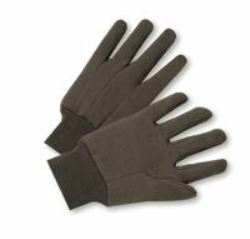 Radnor® Brown Jersey Gloves - Soft Knit Fabric Stretches To Workers' Hands For Perfect All-Purpose Gloves. Clute Cut For A Comfortable Fit, 10 Ounce Brown Jersey Glove Features A Knitwrist. Graphite Replacement for Pt# 99-1258 - 6 in. x 8 in. x 3/8 in.